It’s not unheard of that the Coen brothers would bifurcate—Ethan, for example, wrote 1998's The Naked Man without his sibling—but it’s still a bit jarring. For 35 years, the pair have been responsible for no shortage of American film classics and, as last year’s The Ballad Of Buster Scruggs demonstrated, have plenty of gas left in the tank. 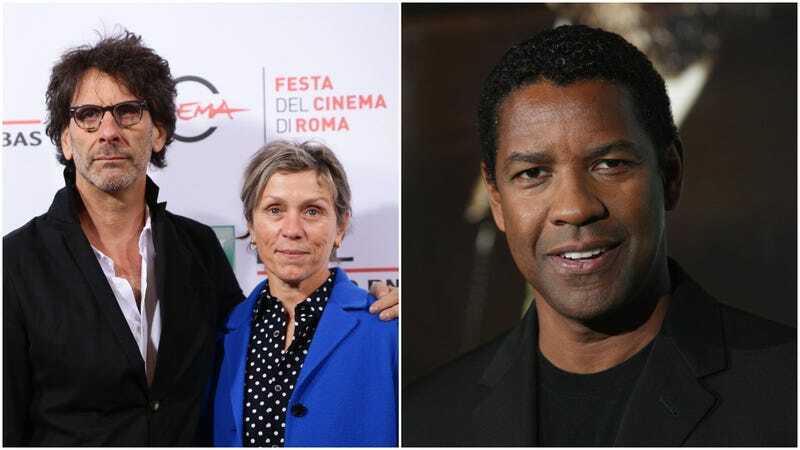 But, for the first time, Joel is going out on his own, directing an adaptation of Macbeth that Variety reports will likely star Denzel Washington and Frances McDormand. Variety’s synopsis of the project doesn’t distinguish it from Shakespeare’s tale of a general’s usurping of the Scottish throne, but it does note that Washington would play the title role, with McDormand as the scheming Lady Macbeth. That’s exciting, sure, but we’re over here dreaming of what a witch coven looks like through a Coen’s lens. Though, hey, maybe it won’t look very Coen at all, what with Ethan occupied elsewhere. We’ll find out when the acclaimed cinephiles at A24, who are handling distribution, let us see it.